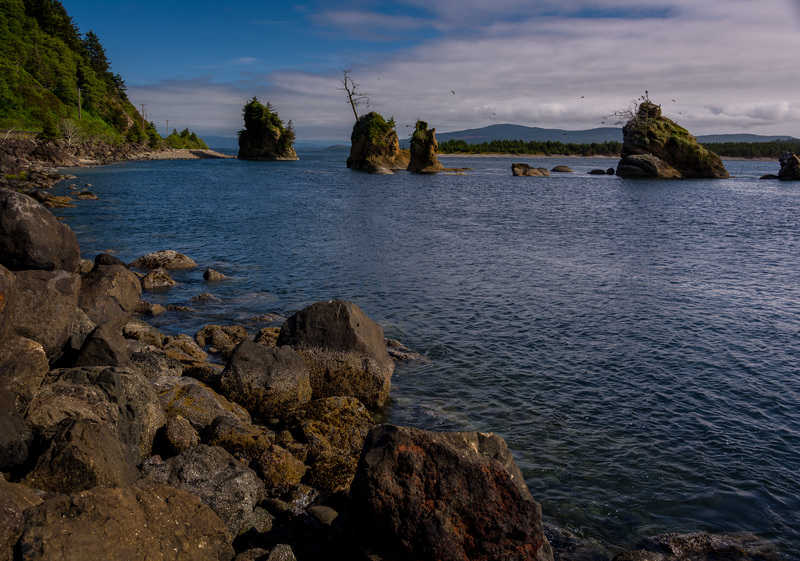 Tillamook Bay is 6 miles long and 2 miles wide. It has 5 main rivers flowing into it, whose waters compete with the ocean’s tides. Nearly plumb in the middle of the narrow, constantly-rushing-one-way-or-the-other channel between the bay and the ocean sit three large rock formations (or four or five if you count the smaller ones…) that have been named the Three Graces. 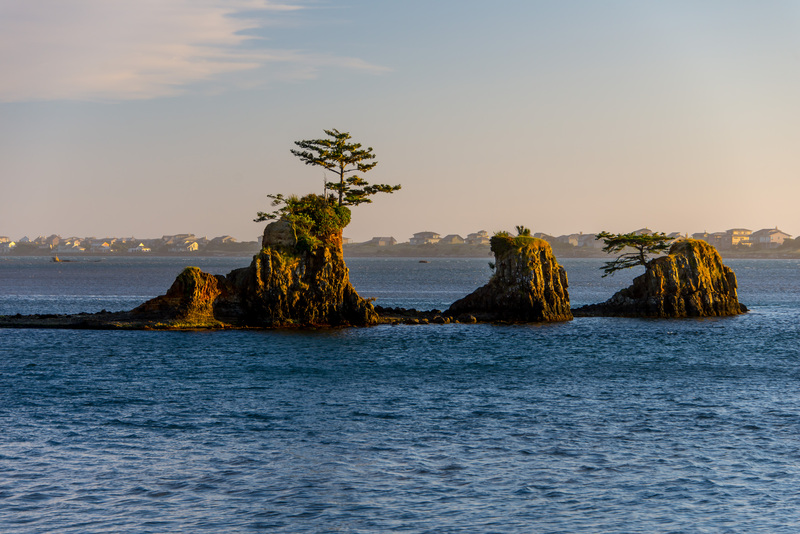 US 101 runs very close beside the channel where they sit just north of Garibaldi, so they provide views night and day as we drive north and south along that route. 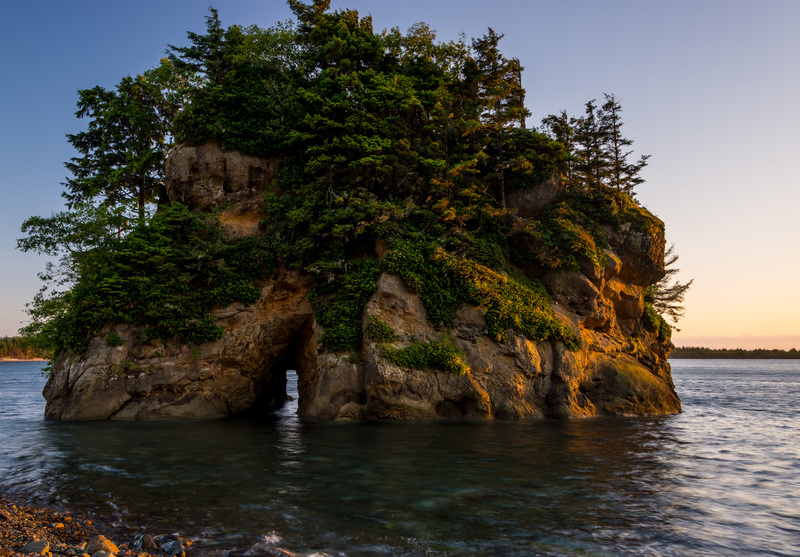 Because the roadway is slightly elevated as it passes the closest rock, you may not notice an arch…. I’m intrigued that so many arches occur perpendicular to the usual direction of water flow. which is true here. 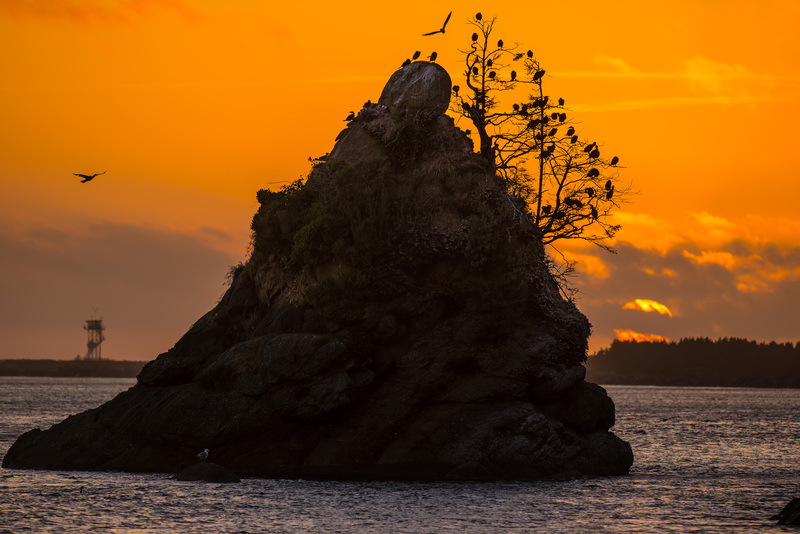 Perhaps the greatest claim to fame for these rocks is their status as a nighttime hangout for birds…primarily cormorants. 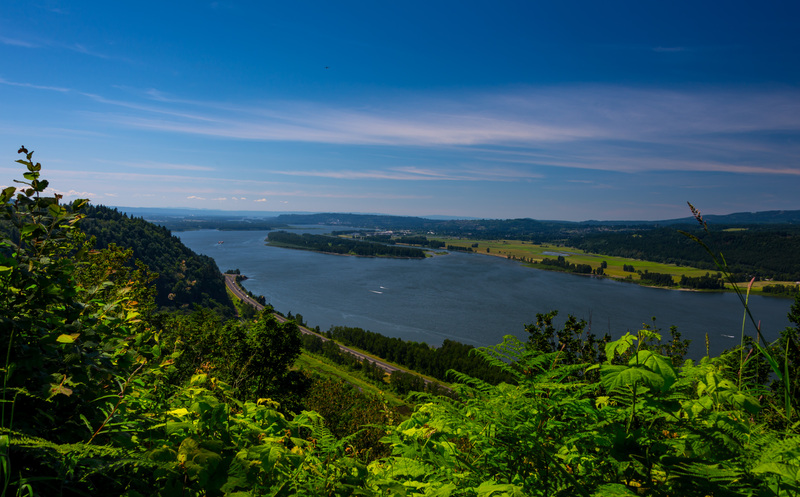 For years, I’ve wanted to spend time along the Columbia River. I’ve seen so many lovely photos of the river, the surroundings of its gorge, and the numerous waterfalls. Sure….so we spent part of one day blowing through about 20 miles of the gorge. Well, this was only our first visit, and there’s soooo much else to see out this way…. 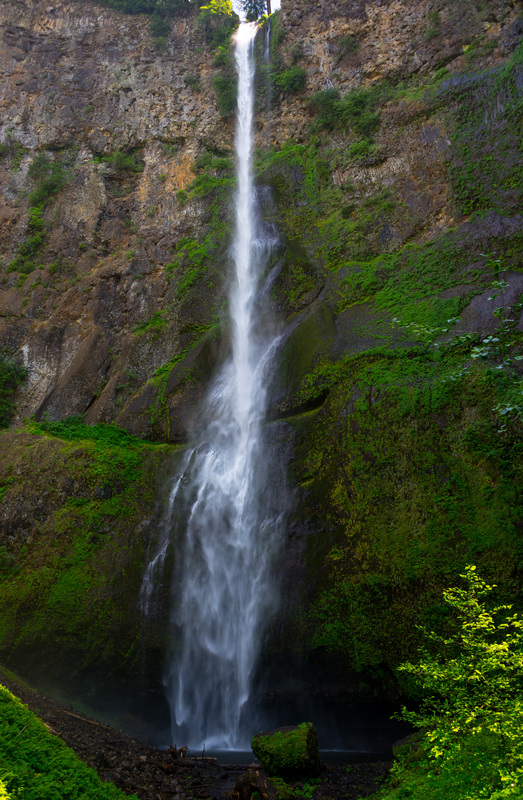 As soon as we arrived at Multnomah Falls, I knew I was in trouble. As Tiny Elvis says, “This thing is HUGE!” Very challenging to get a good photo that shows everything, particularly in bright sunlight. These photos feel too much like documentary shots. I hope to return next year and try for something with more mood! It’s pretty amazing the way I-84 is routed right alongside the river for about 150 miles….lovely and scenic….a very involving drive. We came into town on that road. 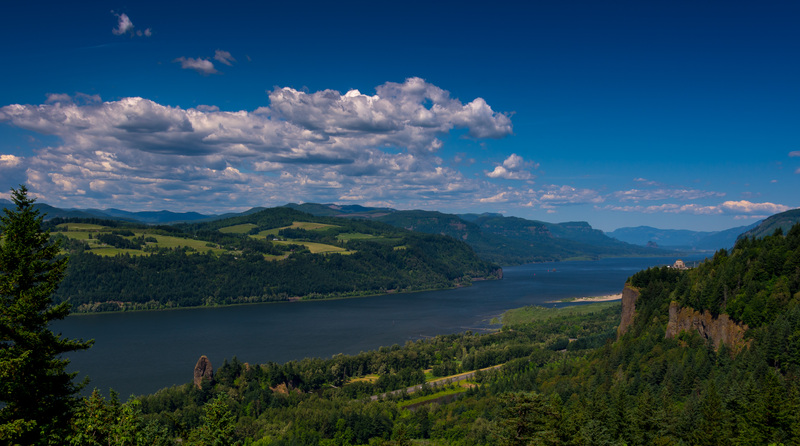 But for this day’s exploration, we traveled the Historic Columbia River Highway. This first picture looks to the northeast, past Vista House on Crowne Point. 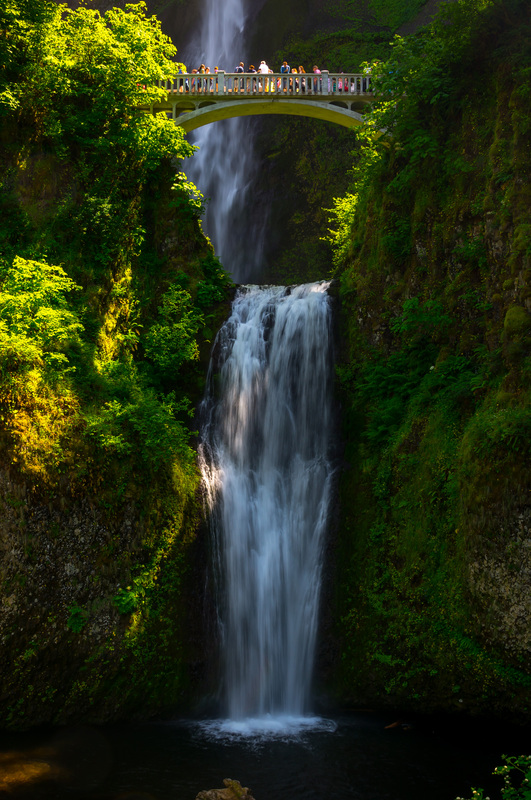 If Oregon couldn’t show anything with the color green, it wouldn’t have anything to show…. What a vista we had as we drove the Historic road! This second picture was taken from almost the same spot as the previous, just rotated about 90 degrees. The scale is hard to comprehend. You’re seeing I-84 where it nearly touches the river. See the tiny plane at the top? It’s a commercial jet…. 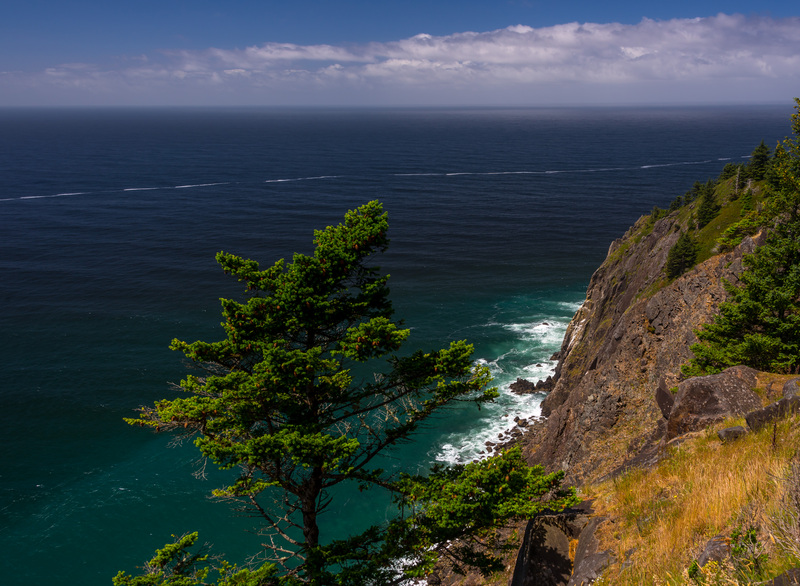 Of course, Tillamook is more than the ocean shoreline. 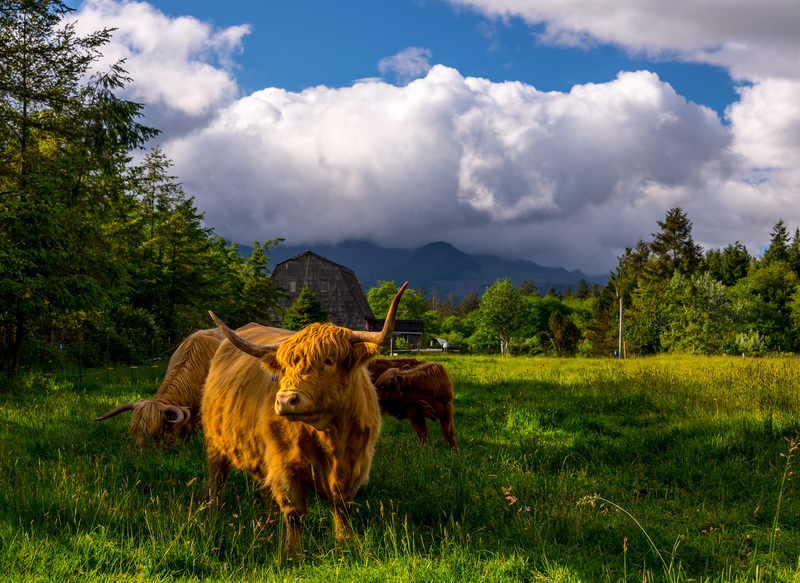 Everywhere we go, when people learn we’re headed to Tillamook, they enthusiastically recommend we stop by Tillamook Cheese, take the plant tour, and taste some curd. The surrounding community for miles is comprised of dairy farms…because the cheese factory is a farmer’s co-op. They own it, they supply it, they promote it in every way possible. We ran across this young one, who showed more flair than most local cows. Still, it’s the shoreline that fascinates us. Not certain why…still exploring the issue. We’re parked about 60 miles south from the Washington border. The coast here offers pretty dramatic differences in short order. 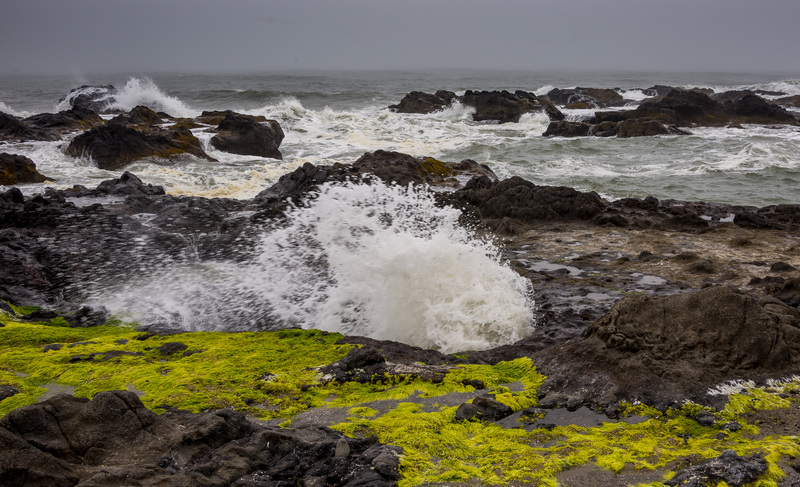 Always with the relentless waves…the sound, the spray, the motion, the color. Click on that picture to make it fill your screen. Notice the hillsides in the distance. You’re seeing one of Oregon’s major crops…lumber. Those hillsides show the effects of clear-cutting major sections over many years. The ocean surface has been much quieter here than we usually experience south in Trinidad, CA…about half the wave height. Water temperature is about 4 degrees cooler, too. Maybe more rocks, and certainly more arches! Near our day’s foggy destination, we had a bite of lunch at Luna Sea Fish House (say those first two words quickly…). Not surprisingly, it provided quite superb fish & chips. Very surprisingly, it also offered quite superb bean burritos! 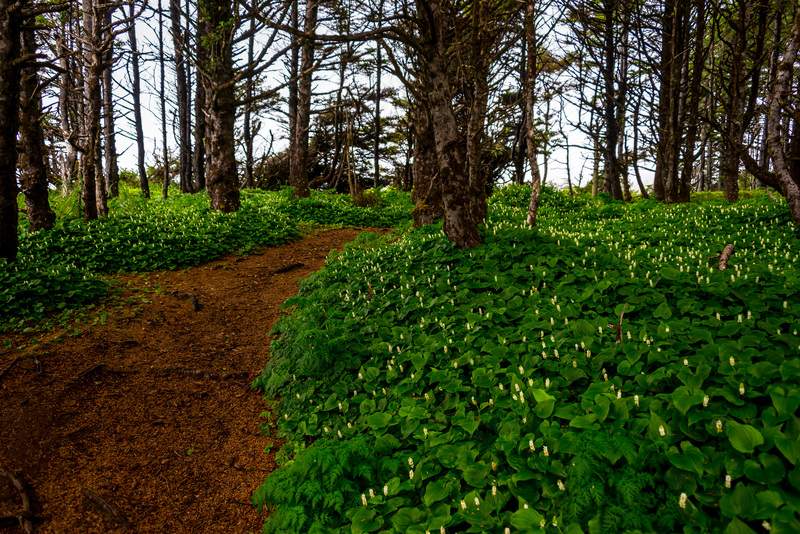 We took some of our meal as a picnic a few blocks away to the point of land’s end in town at Yachats State Recreation Area. We discovered you don’t pronounce the c in that name, and the first a is pronounced more like a u. It was nearly high tide, and the wind was making the waves slam pretty good. 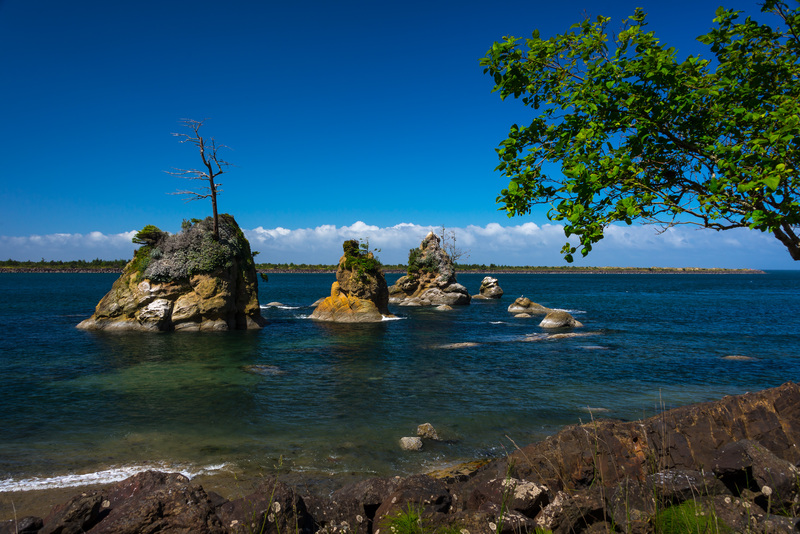 Fascinating rocks along the shoreline…volcanic type material. I found a hole back from the edge that had a series of tunnels bringing waves and swells to it…with occasional explosive results. Mostly, the shoreline here was extremely rough and inhospitable. But it sure got an A for interesting! 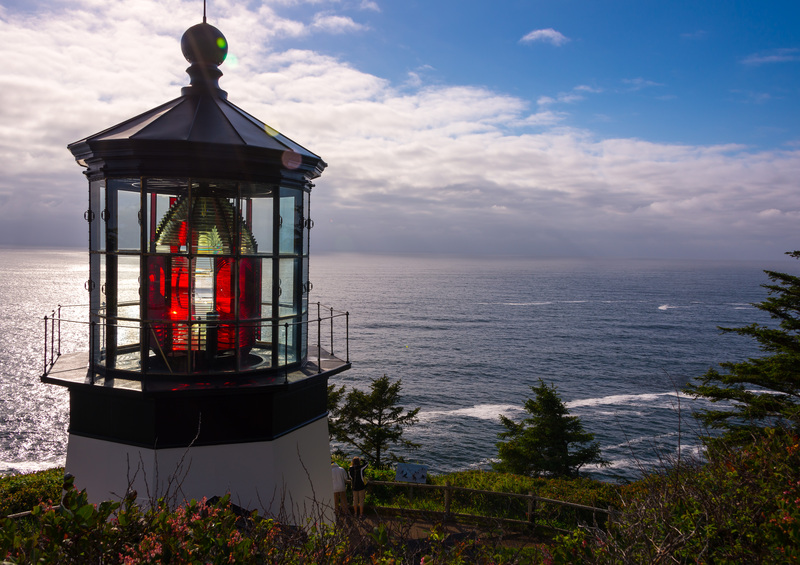 As we neared Cape Perpetua, things got waaaay more interesting! 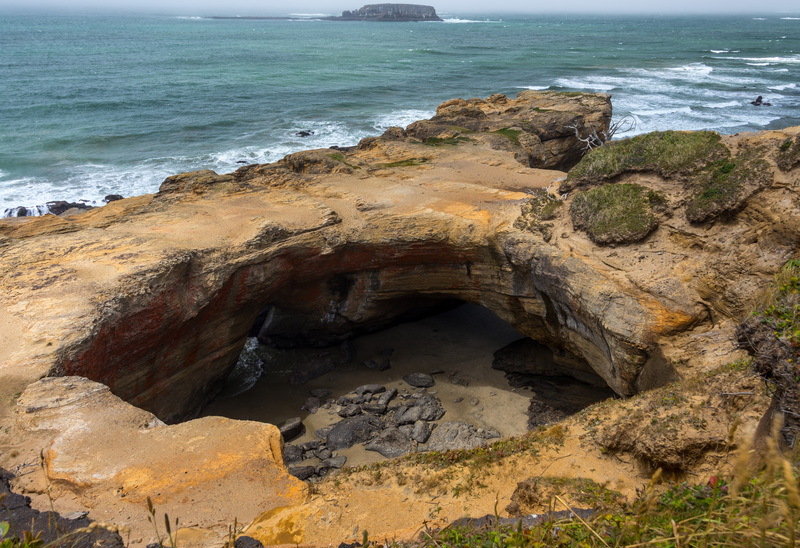 Check this out…that’s no creek emptying into the ocean: it’s a crack that has been pounded by the surf for so long, it’s opened up a lengthy chasm. 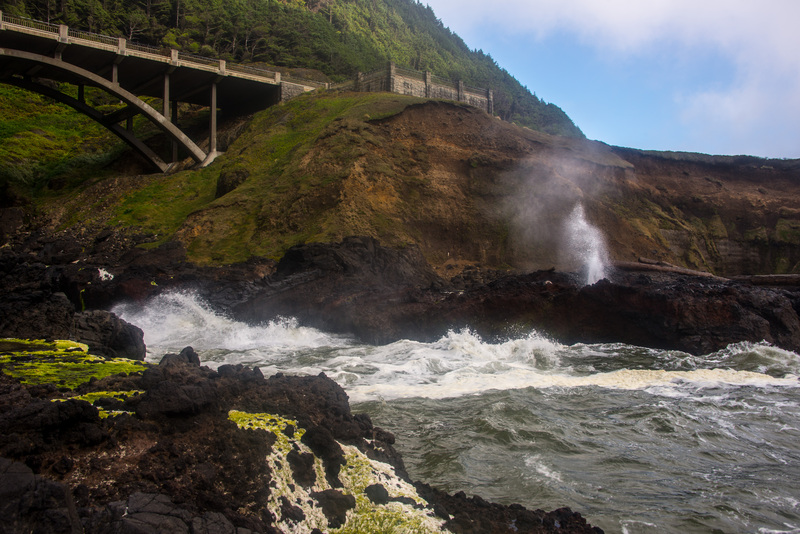 It was named, and even had its own overlook: Devils Churn. 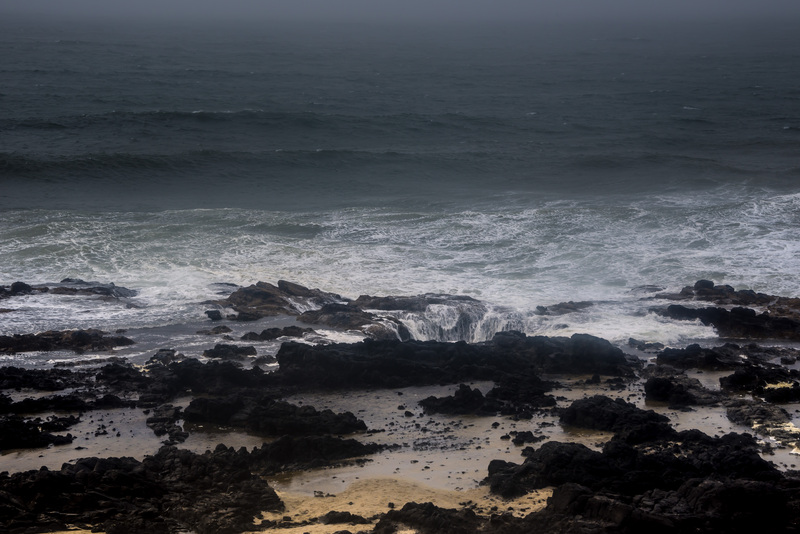 Around the corner, we reached the conclusion of our day’s journey: the tip of Cape Perpetua, with Cook’s Chasm and Spouting Horn. Just look how close they are to US 101! I had also been looking forward to seeing Thor’s Well at this location, because I’ve been seeing pictures of it for years. Unfortunately, the wind was blowing spray for hundreds of feet, and I wasn’t able to get close enough to clearly show this large hole that swallows endless waves that crash over the rock edge in front of it. As it was, this photo was taken with a mist of salt spray on the lens! We turned around at this point, exactly 100 miles from the coach, and headed home. We’ll be back to several of these places for more detailed exploration! 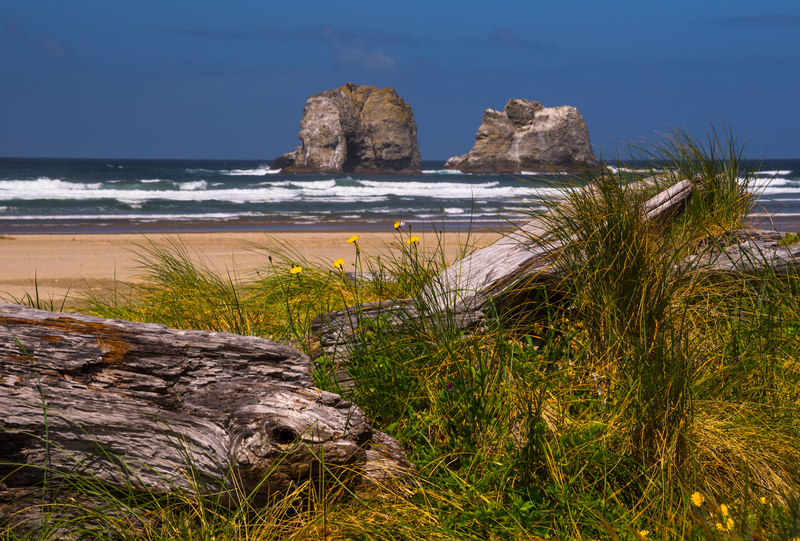 We enjoyed this Pacific Northwest coast during the past two winters, because it’s warm without getting hot. Which is precisely why we are enjoying the summer here! It’s often foggy in the morning, clearing by noon, and a high temp for the day of 65 degrees. We popped over to Portland last week…and found ourselves suffering in 85 degrees…in early June! 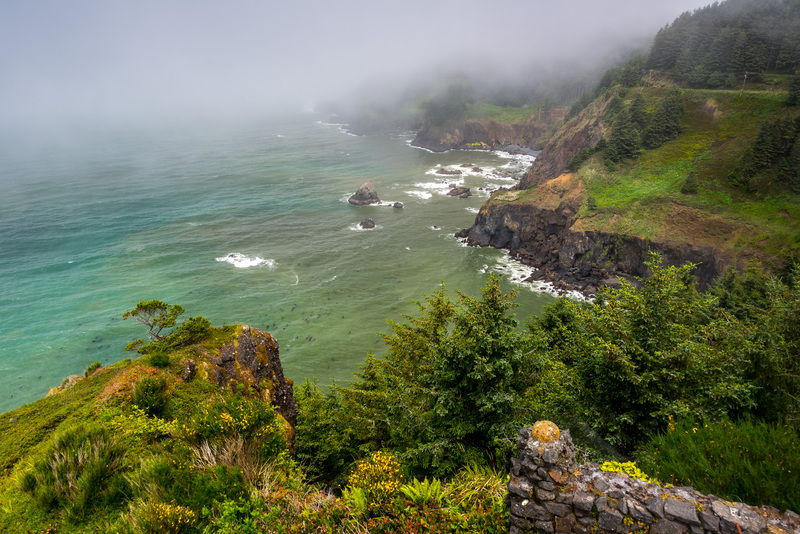 So this day down the coast started with fog, alright, but it didn’t seem to be aware of the forecast that sun would be showing itself by noon…. We found ourselves 65 miles south of Tillamook and it was still a heavy fog. 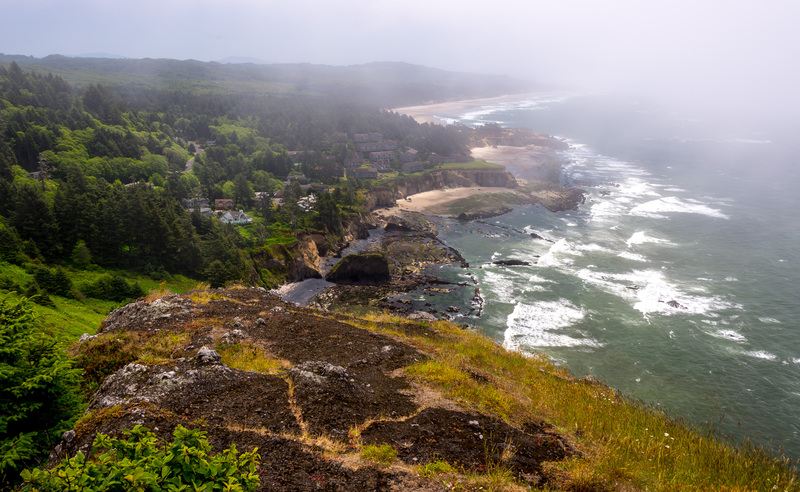 To the south from this elevated vantage point, we could make out the fascinating shoreline past Otter Rock all the way to Devils Punchbowl. 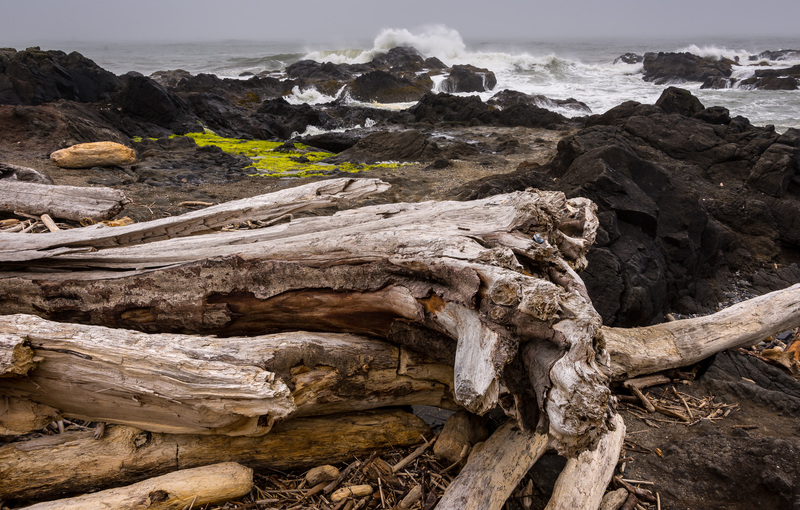 Despite the fog, the sun still managed some very kind and useful appearances, especially at the Otter Rock beach. Cool place at low tide, that offers an easy walk into the Punchbowl through an arch at the bottom left of this photo. You really don’t want to push your luck with the tide while inside the Punchbowl, because it gets water from an opening to the sea where you see water to the left in the photo below, and your entrance from the beach is below sea level…which fills quickly once the tide rises just a little! I’d love to be here at high tide following a big storm at sea…can you imagine the wave action in the Punchbowl? They say it was a sea cave whose roof collapsed. Our trip was still far from over, and our surprises continued in a new form. 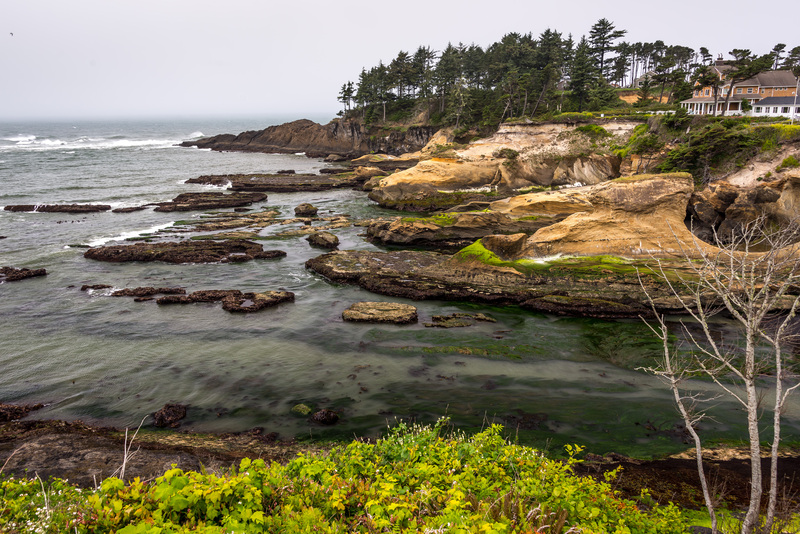 Along this coastline, nature is usually noteworthy for its geology and interaction with the ocean. At Yaquina Head Outstanding Natural Area, we stopped in the information center parking lot to walk Ross & Ryan in an area that was somewhat protected from the wind that had become pretty extreme. We weren’t the only ones to recognize that fact. A pair of Peregrine Falcons figured that out several years ago, and have been raising an annual brood of chicks here ever since. 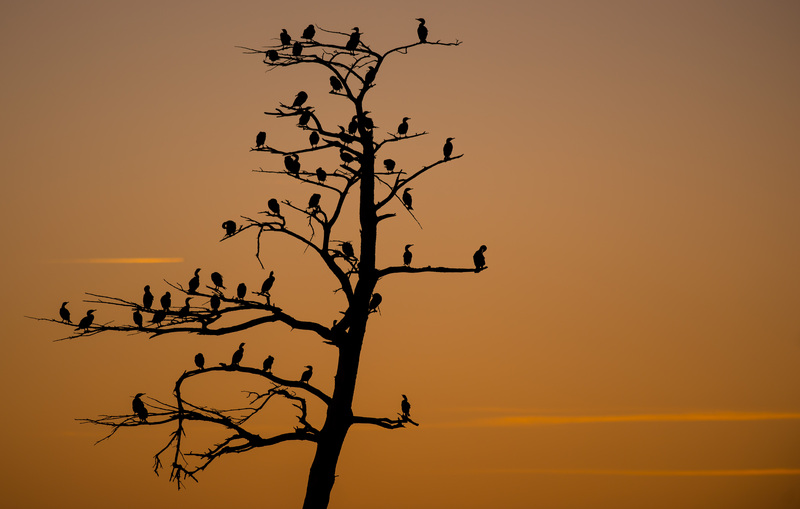 A man was set up in the parking lot with a camera and a zillion dollar lens to monitor four youngsters who are within 10 days of fledging, he said. 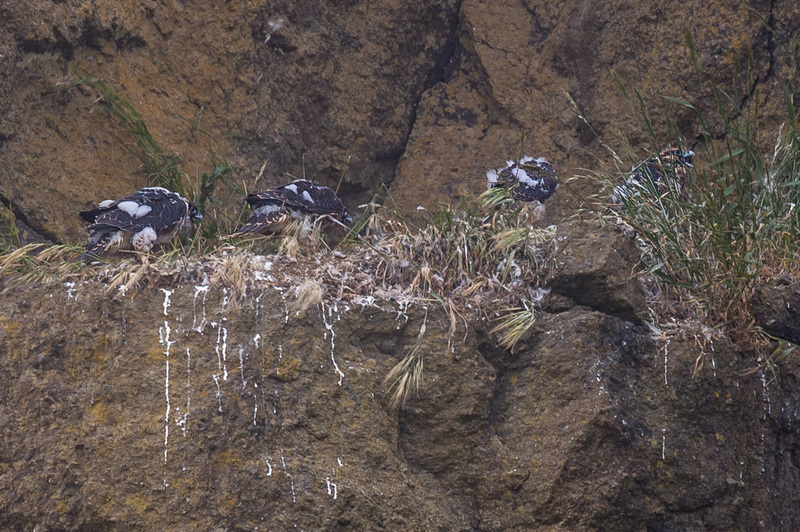 You can see their white baby down in tufts, and three can be seen squawking their concern about food (the fourth has his tail to us, but he or she could still be heard!). 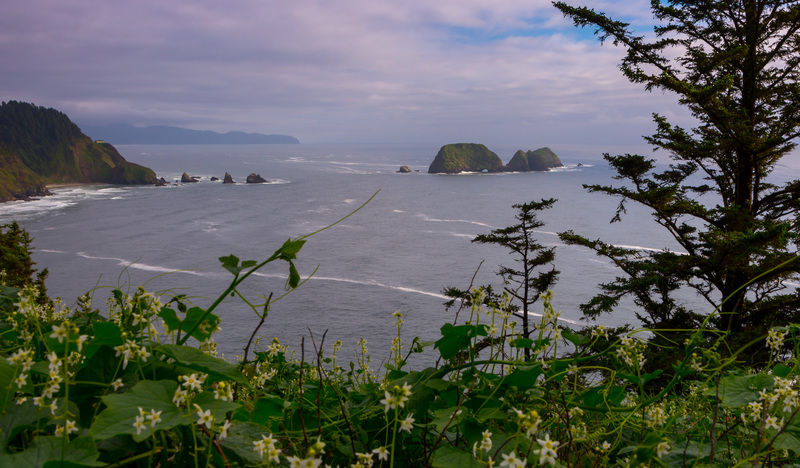 We bit off a big chunk the other day…driving 100 miles down the coast, taking in all the sights, and coming back home! It was easy…we just didn’t stop! We didn’t see all the sights, and we sure didn’t explore in much detail, but we sure found some great places for several return trips! 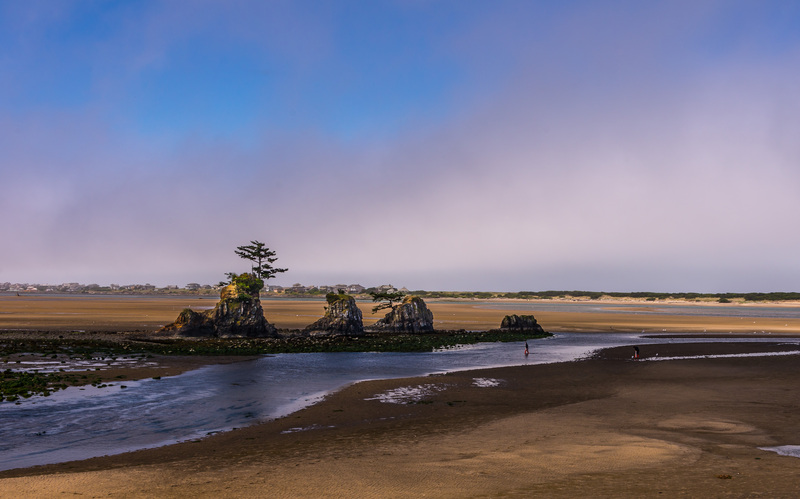 South of Lincoln City, US 101 crosses one small finger of the Siletz River as it empties into Siletz Bay. These four stacks of rock and earth stand high and dry at low tide right near the bridge. 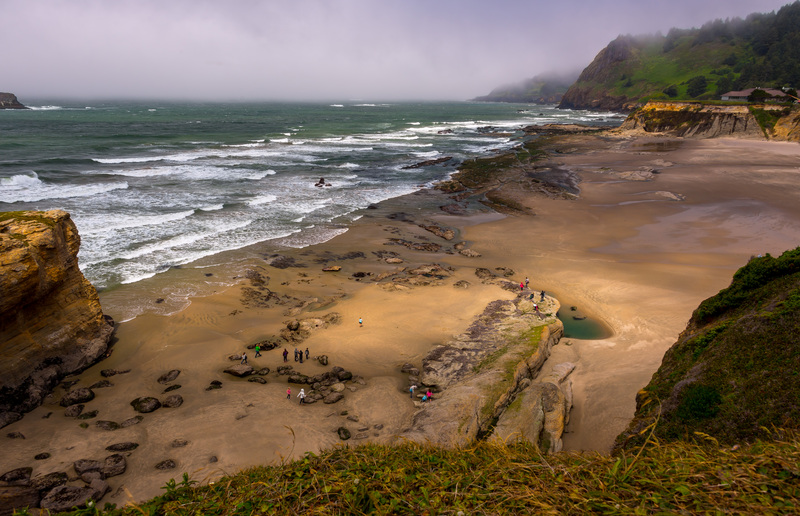 If you enlarge this picture, you’ll see two people with clamming equipment…which helps give perspective for the size of this bay. I still marvel at the ability of the ocean tide to fill such an expanse with more than 5 feet of water in 6 hours, then drain it during the next 6 hours! 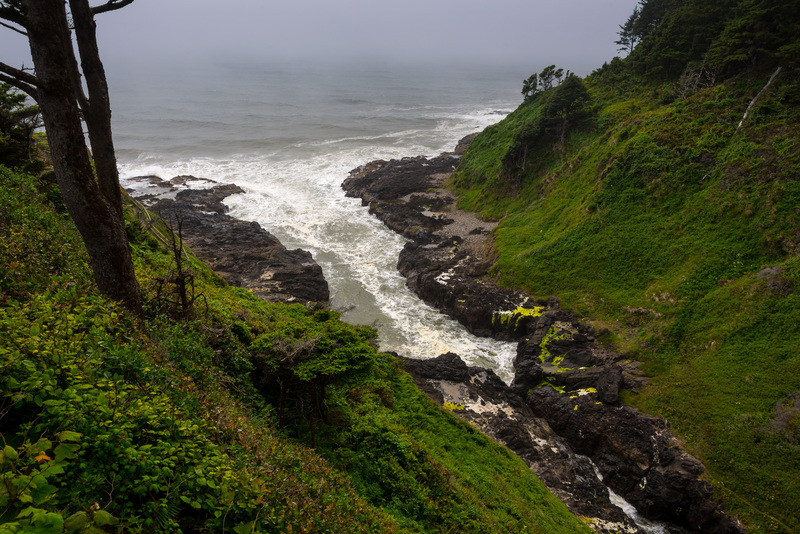 As we neared Depoe Bay, this small cove was immediately beside the roadway. 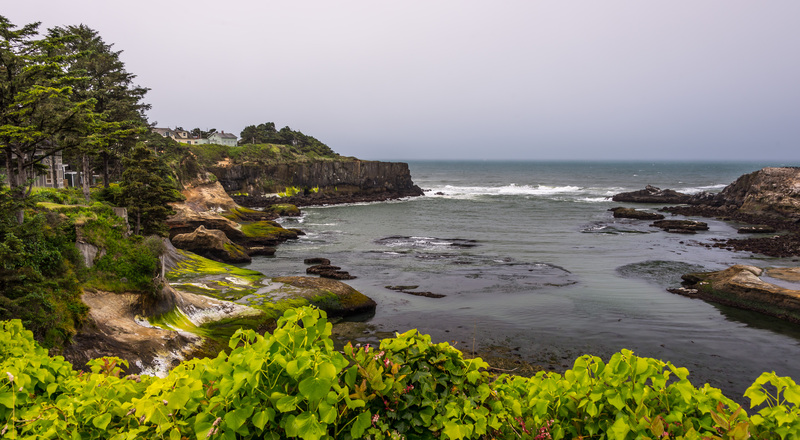 We were attracted by the colorful drama of the land beside the homes on the left, but as we got out of the car to shoot pictures, we realized the right side was completely occupied by animals…the seals in light color, and the birds in mostly dark color! It turned out these homes were located on a small peninsula, and the other side of it was even more dramatic! The green you see in these pictures is the real thing….almost flourescent sometimes, and the trees/bushes/ferns/grass/moss/hayfields are so rich and thick…no drought around here. The last picture for this post is actually from our return trip home on this day [but come back for two more posts of pictures from this one-day trip!]. I think this picture suggests the post should’ve been called “is the cup half full or half empty?” See what I mean about the tide changing a scene so much it almost looks like a different place?